I hope everyone had a great and safe Thanksgiving. I am back on track after taking a bit of time off to spend with friends and family. This week I take a look at RoMa Craft Tobac’s Cromagnon Black Irish paired with a bottle of Belching Beaver’s Good Morning Beautiful. 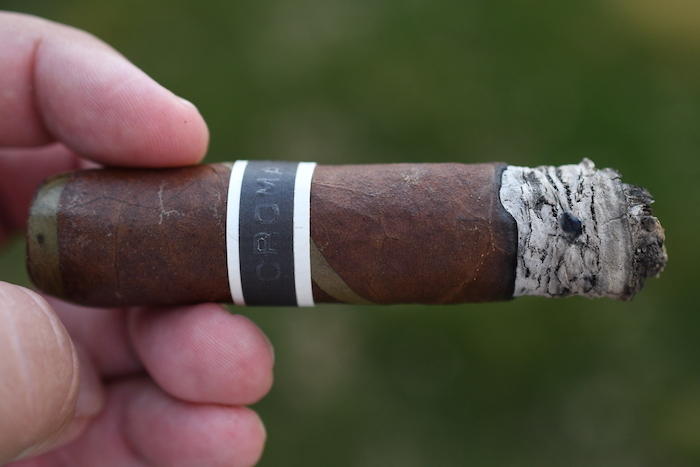 By now you should all be familiar with the Cromagnon line from RoMa Craft Tobac as it was the debut blend that launched the company into what it has become today. Back in 2013 the line was expanded with the addition of a Candela version of the cigar and this year it was expanded once again with an extremely limited production blend of a Candela/Broadleaf wrapped cigar called the “Black Irish”. The Black Irish is offered in a single 5 x 56 format and starts out with a Connecticut Broadleaf / Candela barber pole style wrapper over a Cameroon binder and Nicaraguan fillers. The blend is very difficult to find and I was lucky enough to nab mine from a buddy who I’m pretty sure had a hard time parting with them (Thanks Jason!). 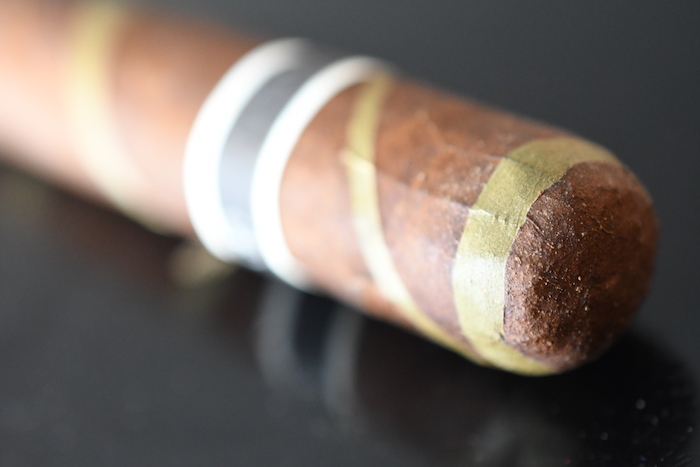 The obvious stand-out characteristic of the Black Irish is the beautiful barber-pole style wrapper on the cigar where the Connecticut Broadleaf and Candela wrappers overlap each other giving a candy-cane style effect. The Broadleaf is a beautiful dark, consistent brown and the small amount of Candela is an olive green. The construction on the cigar is flawless as the wrapper is laid seamlessly over itself. 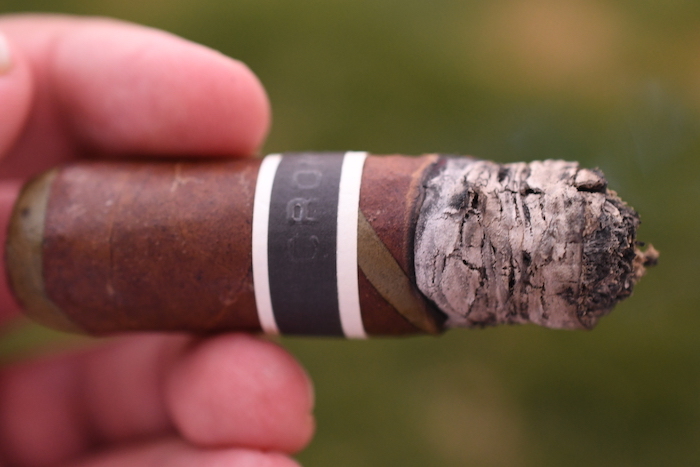 The wrapper’s texture is pretty toothy with a good amount of oil while the candela portion is a bit smoother than the broadleaf. 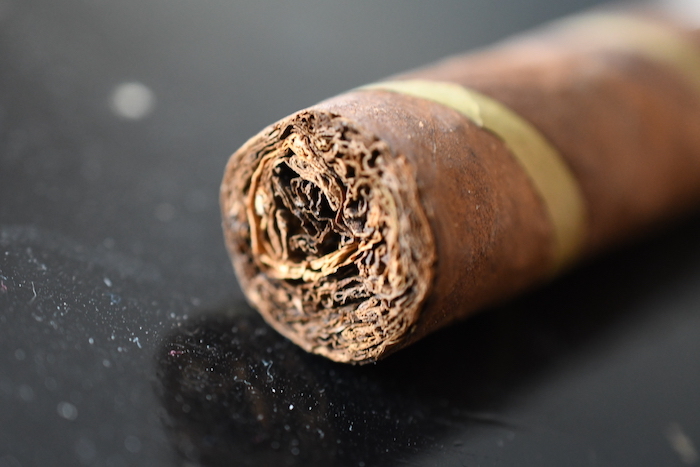 The wrappers feel very dense and hard while the cigar as a while is firm to the touch with no soft spots leading up to the cigar’s rounded double-cap. 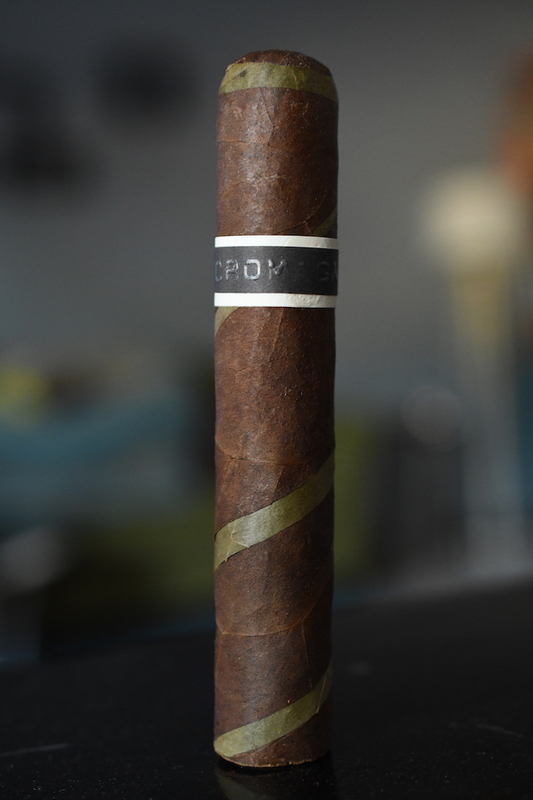 The cigar is then polished off with the standard, elegant, black white Cromagnon band which I absolutely love. 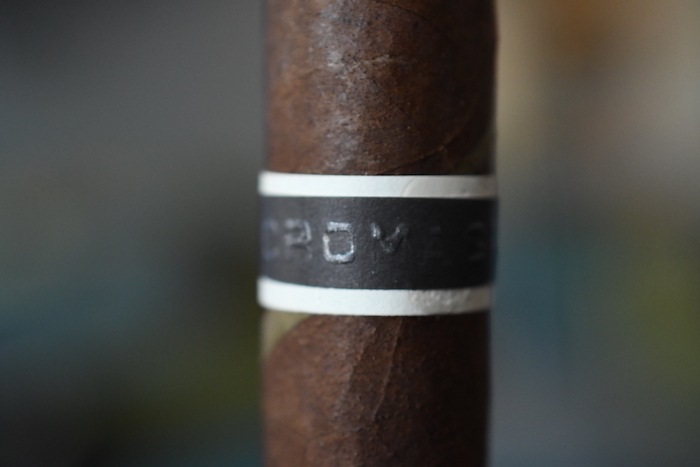 The band features an embossed “Cromagnon” logo in the front and a small, white Roma Craft Tobac logo in the back. Band design doesn’t get much cleaner than this. The wrapper on the Black Irish gives off some great spice aromas, sweetness, and coconut while the foot of the cigar carries much more spice, pepper, musk, and natural tobacco scents. The cap cut clean and easily using my double bladed Xikar XO cutter. The cold draw produces some great musk, pepper, spice, and oaty flavors. The Roma Craft Tobac Cromagnon Black Irish starts out with a subtle little black pepper zing, just enough to tease my tongue before transitioning into a melody of sweet chocolate and coffee notes back by some herbal tea type flavors, coconut, spice and musk. The draw on this bad boy is phenomenal. Each tiny little puff kicks out a whole mess of thick white smoke which hangs around for a considerable amount of time before dissipating. The cigar also releases a pretty fair amount of stationary smoke as the oils burn from the wrapper while the cigar rests in my ashtray. 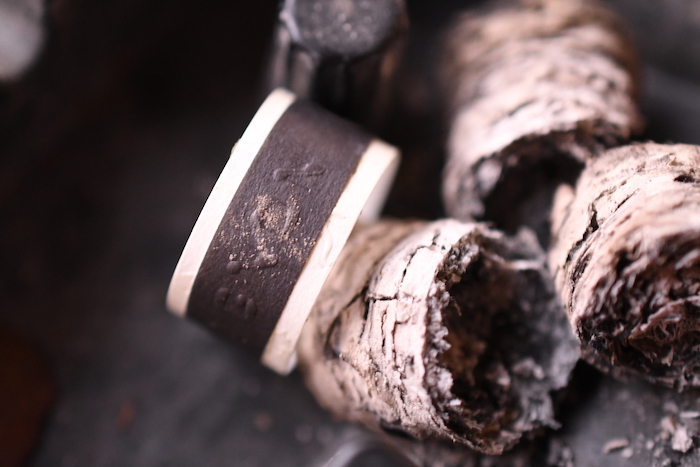 The burn line is very even and razor thin leaving behind a trail of compacted medium gray ash which held on for almost an inch before falling into my ashtray. As I continue into the second third of the Roma Craft Tobac Cromagnon Black Irish the chocolate and coconut really begin to take center stage backed by sweet brown sugar, musk, black tea, and spice. The flavor profile is phenomenal. I find retrohaling the cigar really brings out the musk and spice while not being too harsh on the nasal passage. The cigar is still burning perfectly without any help from my torch as I close out the second third with nothing in terms of nicotine. Into the final third of the RoMa Craft Tobac Black Irish and the flavors continue to pour out pure awesomeness. The chocolate and coconut still lead the charge, the tea has became much more prominent while the backing flavors are a subtle mixture of musk, spice, and a bit of floral pings here and there. 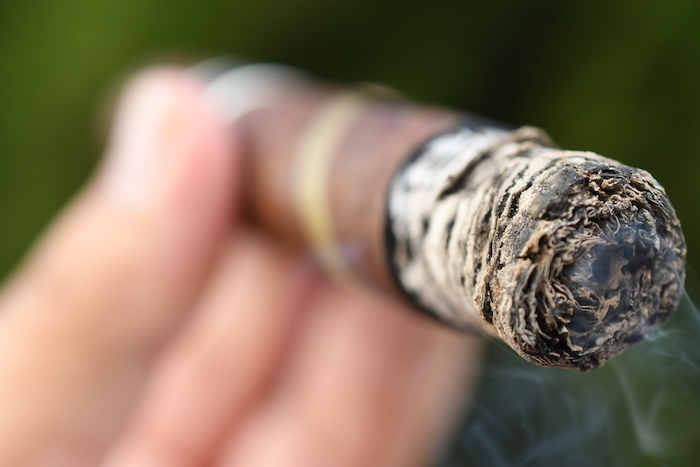 The cigar took me almost two hours to take down to the nub and I experienced absolutely no harshness, nor extended heat while it burned flawlessly from start to finish and I never once had to reach for my torch to touch-up or relight my cigar. Belching Beaver’s Good Morning Beautiful is one of a series of releases the brewery has created to celebrate the Deftones. This 5.5% ABV brown ale is brewed along with coffee, coconut, and maple syrup. The beer leads with a very light body with hints of coconut, malt, chocolate and really light coffee with an incredibly thin mouthfeel before finishing clean with more malt and coffee. The beer itself is a bit lacking and I really expected more flavor for it. If it I had to pair this cigar again I’d toss in a heavy imperial stout, sweet bourbon, or even some sweet iced black tea.